These days, it feels like the entire country has the blues, and many of us want to escape to a better time and a better world. Music provides the means, the access point to a world where things make some sense, a world where Nazi sympathizers aren’t in positions of power. And perhaps especially helpful is music with something of a classic sound. 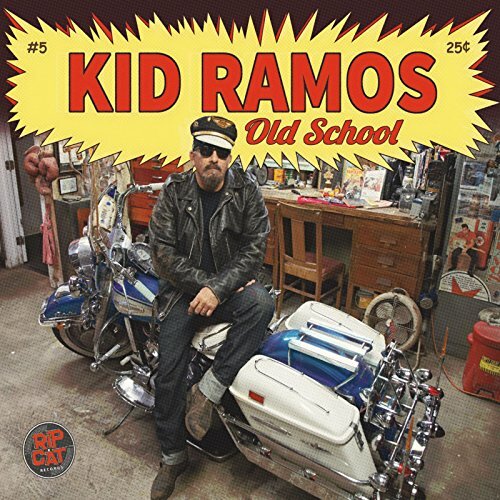 Old School, the new release from Kid Ramos, features a good mix of classic blues and early rock and roll, along with some original material written or co-written by David “Kid” Ramos. Joining him on this album are Kedar Roy on bass, Marty Dodson on drums, and Bob Welsh on keys. There are also several special guests performing on certain tracks, including Kim Wilson on vocals. Kid Ramos was, for a time, a member of The Fabulous Thunderbirds, and it’s great to hear him playing with Kim Wilson again. This album was recorded at Jon Atkinson’s studio, where they use all analog equipment, helping achieve that classic sound. This is where they also recorded Johnny Tucker’s recent album, which features the talents of Kid Ramos, Marty Dodson, and Bob Welsh. And on this release, Johnny Tucker sings on several tracks (and also co-wrote some of the material with Kid Ramos). So it has a relaxed, friendly, natural vibe, and the music feels real. You know? Old School opens with “Kid’s Jump,” an instrumental track with a great, classic rock and roll, rhythm and blues sound, driven by the guitar. I absolutely love this kind of music, and I honestly don’t see how it’s possible to dislike it. This is an original composition by Kid Ramos, and it’s a great start to the album. More classic, timeless sounds follow with a wonderful cover of bluesman Magic Sam’s “All Your Love.” Kid Ramos’ son Johnny joins him on this track, performing lead vocal duties. Does he sound a bit young to be singing the blues? Maybe, but he does a good job, and keep in mind that Magic Sam was pretty young when he wrote and recorded it. This is Johnny Ramos’ first appearance on an album. Kid Ramos delivers some delicious work on guitar here. The long fade-out is a bit odd; this song feels like it should have a more solid, definitive ending (though, again, the original recording had a fade-out too). Johnny Ramos also sings on a cover of “Anna (Go To Him),” a song written and originally recorded by Arthur Alexander, but more famously done by The Beatles. Bob Welsh provides some nice work on piano. Johnny Tucker joins Kid Ramos on vocals for “Tell Me What Ya Want (And I’ll Give Ya What Ya Need),” a song they wrote together. That gloriously rough voice is effective, and this song has a kind of fun vibe. “I’ll give you what you want, tell me what you need/I’m here to love you, and I’m here to please.” Oh yes. Plus, this track features some good, expressive work on guitar, and I totally dig what Bob Welsh does on organ. That’s followed by another original tune, a very cool instrumental track titled “Mashed Potatoes And Chili.” Listening to this music, I can feel my blues slip away. Kid Ramos then takes us back to the early days of rock and roll with a cover of Buddy Holly’s “Heartbeat.” This time Kid Ramos provides the vocals. Kid Ramos also sings on the cover of “Mona Lisa.” Johnny Tucker joins Kid Ramos again for “You Never Call My Name,” another song they wrote together, and a track which features no other musicians – just vocals and guitar. I am seriously digging this track, the raw and immediate sound of it. Kid Ramos also covers Wes Montgomery’s “Bumpin’,” here titled “Wes Side (Bumpin’),” a wonderful bluesy, moody instrumental piece.